It’s more than loving nature. It’s about living life. Today, tomorrow and all the tomorrows after that. We’re headed towards a clearer future. Wanna come for the ride? Ecology and technology. Together at last. We’re taking the futuristic route as we strive towards a sustainable future. Your progressive drive starts with a glance behind using the multi-angle rearview camera with dynamic guidelines. When you’re ready to hit the road, it’s time to hit play. To the right of the pushbutton start, you’ll find the 8″ Display Audio System with Apple CarPlay™ and Android Auto™ compatibility. The 180-watt audio system featuring 8 speakers and a subwoofer is primed to do your playlist justice. 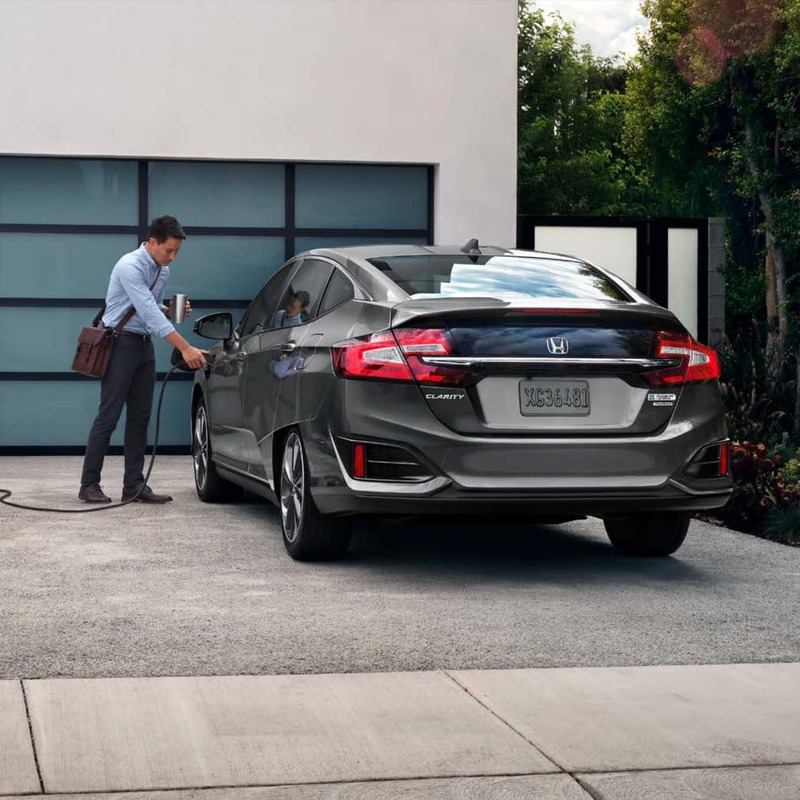 Wherever you’re headed, the Clarity will help you get there using the available Honda Satellite-Linked Navigation System.™ As you follow nature’s twists and turns, the Honda LaneWatch™ blind spot display will help keep you on track. 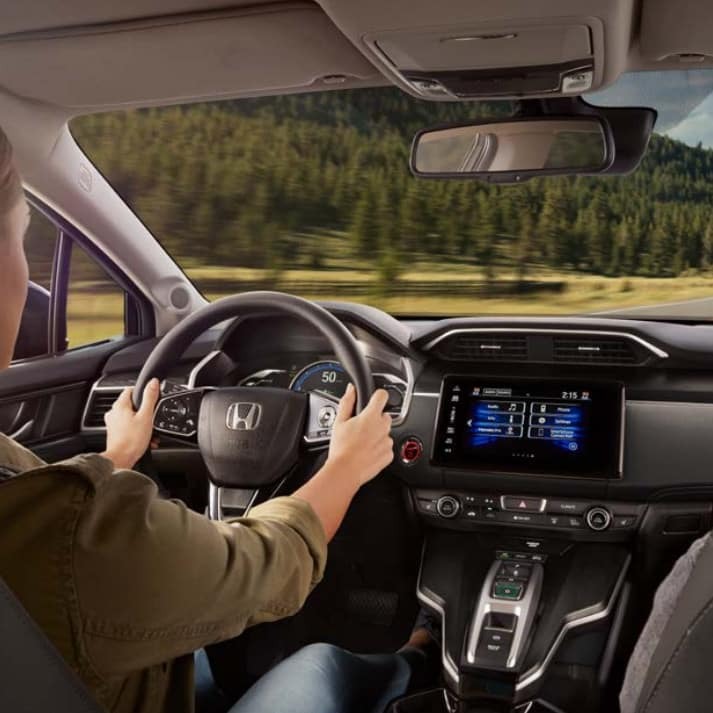 And the HondaLink™ app remote climate pre-conditioning will definitely come in handy between drives, warming or cooling the interior while already plugged in. From the inside and out, the Clarity has sense-tingling tech that’s a sign of the future. And a better one at that. Enjoy a moment of clarity. naturally with a spacious interior that keeps sustainable sourcing in mind. 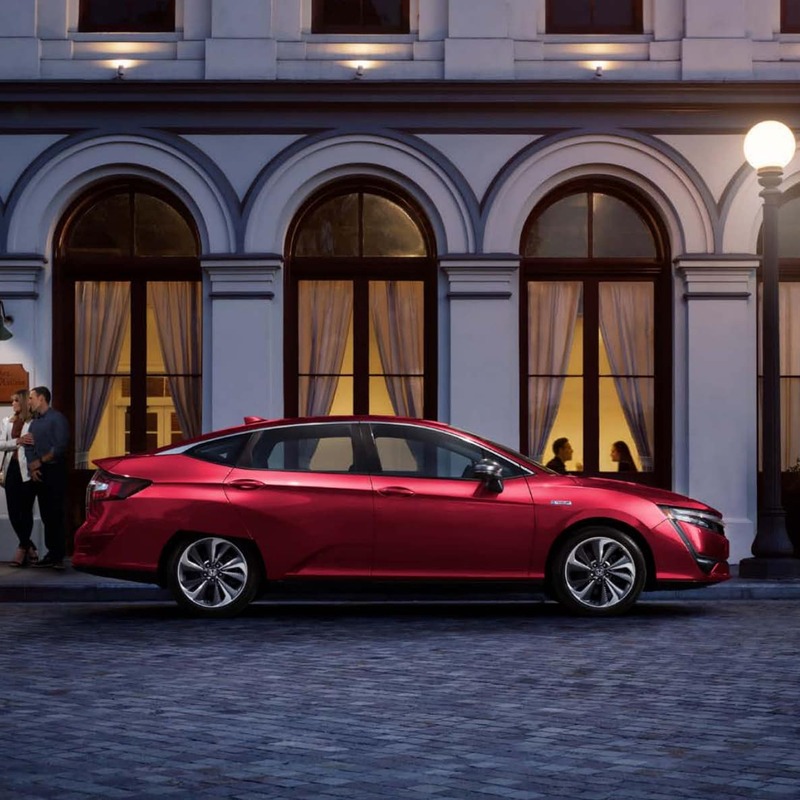 The Clarity Plug-in Hybrid is bound to turn heads and shift perspectives. Hybrid and luxury, in the same sentence? In the pursuit of change, some things are best left as you want them. Like interior comfort. Inside the Clarity, the advanced, spacious cabin comes with ample breathing room – even with five seats. And you’ll breathe easy knowing the premium interior materials are used with sustainable sourcing in mind. With the battery located under the 60/40 split fold-down seats and under the floor, the Clarity owns a best-in-class cargo-carrying capacity of 439 litres. With that boosted space and a T-shaped centre console to boot, the Clarity has the kind of hybrid utility that’s equal parts luxurious and user-friendly. Designed for fuel conservation, the Clarity looks anything but conservative. In fact, a bold, inspired aerodynamic body helps improve efficiencies. Like the airflow-enhancing rear air curtain ducts – a world-first for a four-door sedan. Or the full LED headlights and LED taillights designed to bring a clear vision to the road and your followers. Even the 18″ hybrid-aerodynamic aluminum-alloy wheels feature an aerodynamic design that helps optimize fuel consumption. The 2018 Clarity looks towards the future, and looks good doing it. Driving performance is enhanced with a hyperefficient 1.5-liter Atkinson cycle 4-cylinder engine along with an electric motor that produces 181-horsepower and 232 lb.-ft. of torque, for a combined total of 212 horsepower. Paddle selectors on the steering wheel let you control the rate of deceleration by simulating engine braking, helping to recharge the battery through regenerative braking. electric motor, enabling a combined electric/hybrid driving range of approximately 547 km. The Clarity is a hyper-efficient car rated at an impressive combined city/highway fuel consumption of 2.1 Le/100 km, easily putting it at the top of its class. The combined city/highway fuel consumption for the 1.5-litre Atkinson cycle gasoline engine is rated at an impressive 5.6L/100 km. When plugged into a standard household outlet with the included charging cable, the battery in the Clarity can be charged in as little as 12 hours. The Clarity can be charged in as little as 2.5 hours when plugged into a level 2 charging station (240V).